Since the 2011 AGM the Irish Emergency Medicine Trainees’ Association (IEMTA) have officially become a sub group of the Irish Association for Emergency Medicine (IAEM). IAEM have played strong representative and advocacy role for promoting and protecting Emergency Medicine. IEMTA derives its funding from IAEM and operates under its constitution. There is no longer a separate membership process for IEMTA. When you join IAEM as a medical student or NCHD you will automatically become a member of IEMTA. Medical students are entitled to join as affiliates which is free currently. Trainees are entitled to join as associates and get a reduced rate for attending the annual scientific meeting. Attached is the IAEM membership pack. Congratulations to all our members who have been selected to present their research at the IAEM 2014 Annual Scientific Meeting. Best of luck to the presenters, many of whom are IEMTA members, giving oral presentations on Friday. Their abstracts are now available on-line as a supplement in the Irish Journal of Medical Science. Click here to access the abstracts. IEMTA will be hosting a social evening this Thursday (16th October) after the Code Black Film which concludes day one of the IAEM 2014 Annual Scientific Meeting. The event will be in Whiskey Fair on Dun Laoghaire Main Street (WhiskeyFair.ie). There is no entry cost for this event and finger food will be served, so we expect to see you all there! We need to get numbers for catering so please let us know if you plan to attend. IEMTA’s AGM will be held on Friday (17th October) in the Royal Marine Hotel, Dun Laoghaire. It will take place directly after the Leo Vella lecture, which closes the IAEM 2014 Annual Scientific Meeting. Attached is the provisional agenda and the minutes of last year’s AGM. If there is any item you would like listed on the agenda please contact us. We are actively seeking a representative from each year on the CSTEM to represent your year groups to work with the IEMTA committee to ensure that CSTEM trainees are adequately represented in all of our activities. If you are interested please get in touch with Dr Aileen McCabe. Attached is the updated programme for IAEM 2014. The IAEM Annual Scientific Meeting is the premier Emergency Medicine meeting in Ireland. This years conference is hosted by St Vincent’s University Hospital at the Royal Marine Hotel in Dun Laoghaire. One of the major highlights is Scott Weingart of @emcrit who is coming to Ireland to be the key note speaker at IAEM 2014. IAEM 2014 will also host the Ireland & UK premiere of the film Code Black. The film’s director, Dr Ryan McGarry will also be coming to Ireland to introduce the film and answer any questions. For full details visit iaem2014.com or follow @iaem2014 on twitter. 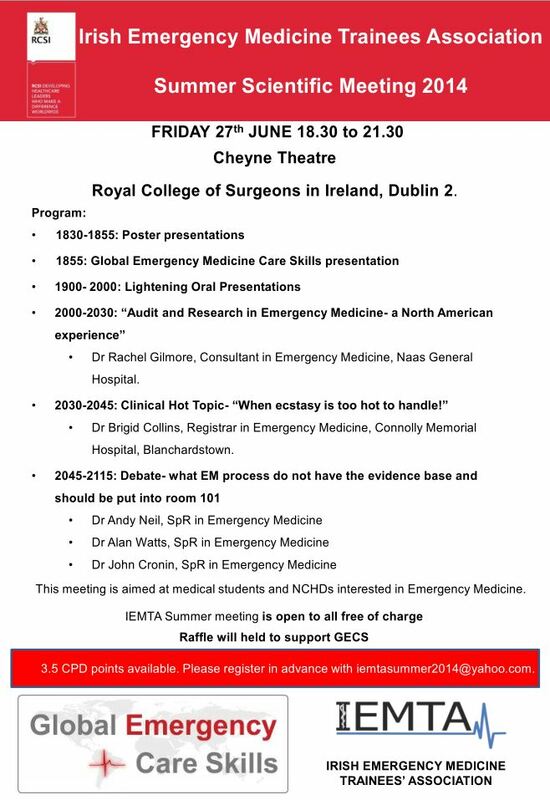 Please find attached the program for the IEMTA Summer meeting being held on the 27th June at 18.30 in the Royal College of Surgeons in Ireland. Please note that the meeting will now be held in the Albert lecture theatre in RCSI. This year we had a fantastic response to our abstract call and there will be oral and poster presentations reflecting the work of Emergency Medicine trainees around the country. Our Keynote speaker will be Dr Rachel Gilmore, Consultant in Emergency Medicine in Naas General Hospital giving a talk, “Audit and Research in Emergency Medicine- a North American experience”. Dr Brigid Collins, Registrar in Emergency Medicine, Connolly Hospital will present a clinical hot topic “When ecstasy is too hot to handle!”- a clinical presentation that is very topical at the moment. We will close the meeting with what promises to be an engaging and entertaining Room 101 debate with three of our foremost articulate SpRs in Emergency Medicine Dr John Cronin, Dr Alan Watts and Dr Andy Neil. There will be a raffle held at the meeting in aid of Global Emergency Care Skills. There will be 3.5 external CPD points available to those who attend the meeting. Please register in advance at iemtasummer2014@yahoo.com for CPD certificates if required. Please disseminate the details of this meeting to all those in your department who may be interested in attending. The meeting is free to all those who are interested in attending. The abstraction submission for this year’s Annual Scientific Meeting of the Irish Association for Emergency Medicine opens today, Monday 16th June 2014 and will be available until 17.00 hrs on Friday 22nd August 2014. The Abstract Submission Form must be completed as described on the form and returned to academicchair@iaem.ie. Please ensure you have read the IAEM Abstract Submission & Presentation Regulations prior to sumitting material to the national meeting. Please find attached the abstract submission form and the abstract scoring sheets. Abstract scoring sheets are included to help ensure the quality of the submitted abstracts. Regarding the recent Limerick HIQA report, the Emergency Medicine Specialist Registrars wrote a letter to the Irish Times which was published today.